A flue dust that contains valuable metals is generated during smelting operation for e-waste treatment. However, metal recovery from this flue dust has not been extensively studied. The flue dust can contain valuable metals such as gold, silver, copper, and iron. 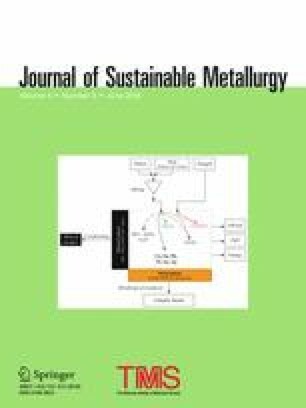 In this study, the flue dust from e-waste was investigated as the potential metal resource for obtaining valuable metals, including copper and iron, using physical and chemical methods. In the physical processes, size separation was performed, and the mass and composition of each fraction were analyzed. Major valuable elements of the flue dust are copper and iron with small levels of gold and silver in all size fractions. The iron is present mostly as magnetite, as determined by XRD. The magnetite was removed by magnetic separation, and the removal efficiency was about 90%. The chemical processes included leaching in various acid solutions (HNO3, H2SO4, and HCl) for copper recovery. The highest recovery efficiency of over 99% was obtained after 8 h in 1 M nitric acid and was optimized at a pulp density of 20 g/L and a stirring speed of 200 rpm at 20 °C temperature. The contributing editor for this article was B. Friedrich. The authors are thankful to the members of the NSF I/UCRC (WPI: 233110) on Resource Recovery and Recycling (CR3) and to the National Science Foundation for their support to this work.